According to the Daily Mail, the average Britain spends around £189 a year on beauty products. 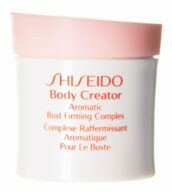 It’s obvious from this that its important to us to keep our skin looking young and healthy, however sometimes when we are smothering ourselves in face creams and body lotions we forget that there are some excellent specialist products out there, one of which is Shiseido Body Creator Aromatic Bust Firming Complex £62. Everyone loves breast’s so its absolutely essential that we take the best possible care of them. This bust firming cream is developed with FRM Fragrance and is a unique combination of Tea Rose Element, Jasmine and Water Lily all of which encourage a youthful and resilient bust. For those who think it is over indulgent or not money well spent to buy a cream just for the bust area, remember that as soon as your breasts start to go south, you’ll be wishing you had given them a little more TLC! Its also worth noting that you wouldn’t use a heel softening cream on your face or an eye cream on your hands, so why just use regular body lotion on our décolletage area, especially as its one of the areas that gets the most attention! This product gives noticeable effects after just a few weeks and although it might come with an expensive price tag it will last you long enough for you to not resent it, plus £48.15 is an absolute snip considering what you would pay for an uplift!